When a low carb breakfast calls for something sweet and little more special than your typical eggs and bacon, this stack of keto friendly pancakes will come to your rescue. Traditional flour pancakes and pancake mix are loaded with carbohydrates that can kick you out of ketosis, but this beautiful stack is completely ketogenic. Additionally these blueberry pancakes are extremely easy to make, great for weekly meal prep, and the LCHF (low carb/high fat) recipe can easily be multiplied for batch cooking. Unlike regular pancake recipes, this one only requires a tablespoon of coconut flour which helps them remain keto friendly, low carb, and gluten free. They get most of their volume from the mixture of eggs, Perfect Keto MCT oil powder, and of course the cream cheese. Using cream cheese in these keto pancakes will also provide extra protein, vitamins, nutrients, and of course healthy fats to help fuel your keto diet. Similar to most dairy products, cream cheese is rich in protein. This is one of the most important building blocks of your body. It provides you with essential amino acids, is needed in a wide variety of functions in your body, and also required to build and maintain lean muscle mass. Not only that, eating adequate protein will help keep you more satiated and full throughout the day. The most important role calcium plays in your body is maintaining bone and dental health. It is needed throughout your entire life. Calcium will strengthen your bones, protect your heart, regulate blood pressure, and protect your teeth. It will also decrease your risk of osteoarthritis and other bone diseases. A great reason to incorporate cream cheese into your keto diet is simply due to its fat content. Cream cheese is calorically dense and can also provide a satiating effect. Foods that are rich in healthy fats will keep you feeling fuller, longer which may help with weight loss goals on your keto diet. Cream cheese is also wonderful because it can be used in both savory and sweet keto recipes like this one. This is what low carb breakfast dreams are made of. Keep in mind that the nutrition content of cream cheese will vary based on brand and variety you purchase. On a keto diet, try to stay away from fruit flavored and low fat ones because these tend to be higher in carbs that can kick you out of ketosis. Make these cream cheese pancakes even more special by adding a little extra cream cheese topping mixed with a some Perfect Keto collagen protein powder topping to them for even more added benefits. Combine all ingredients except blueberries in a medium sized bowl. Whisk well until smooth. Stir in blueberries. Preheat skillet under medium heat and coat with non stick spray, coconut oil, butter, or ghee. Pour pancake batter onto hot skillet. Cook on both sides until golden brown, 2-3 minutes per side. Serve this low carb pancake recipe with sugar free maple syrup, coconut butter, peanut butter, or butter. 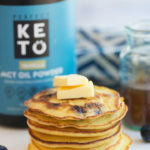 So they give you a recipe for pancakes with the Keto Vanilla MCT Oil Powder as one of the ingredients, but when you click on the link to buy Keto Vanilla MCT Oil Powder there is none to be found. Why have a link if you don’t have that the first thing shown that you can purchase. Would love to try this recipe but can’t without all the ingredients. Hi Micka, thank you for bringing this to our notice! We’re really sorry about this. We have updated the link, it should redirect to the product page now.